Your first phasing in at playschool went so well we were both a little disappointed to leave after our hour’s settling in. 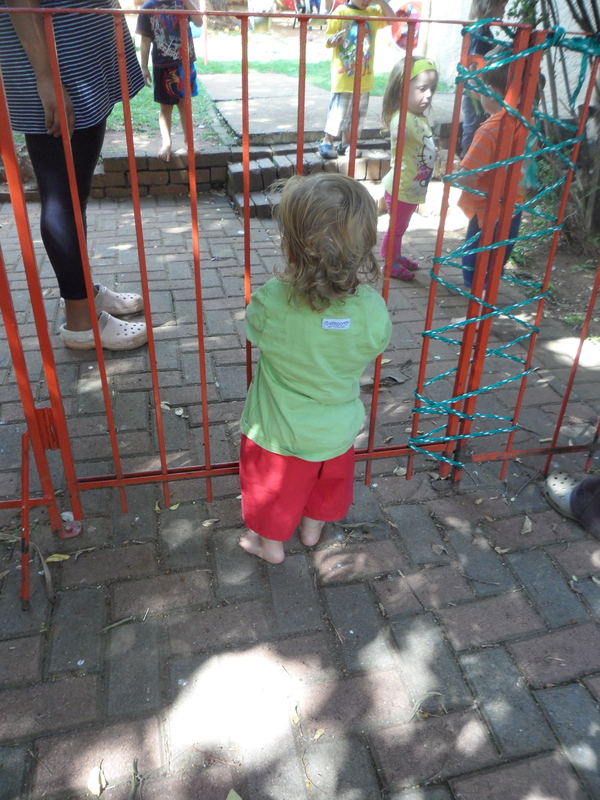 As I expected, a minute after your were through the gate, you left me to go and play with one of the helpers on the jungle gym. 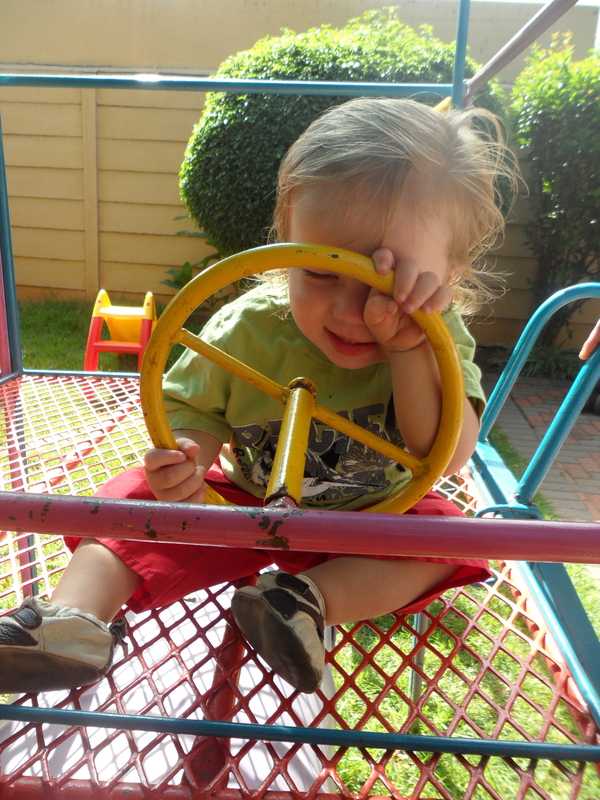 And you found the Best Thing Ever on the jungle gym – a steering wheel. I almost think that if it was a choice between me, milk or a steering wheel, you’d pick the steering wheel. Mavis came too, and in the car I could feel our heavy hearts, and I could feel my tears brewing. Mavis said how much she and Vee would miss you during the day, which made me sad. And so happy, because they are like your second and third moms and adore you so much. I’m glad that in them, we’ve found a family, in a sense (but that’s a whole other blog). The kids (your soon-to-be NBFs) seem cute, and the caregivers look awesome. There’s a lot of singing going on which makes you happy, and soon you’re probably going to wonder why there’s no constant singing and clapping hands at home before mealtimes, playtime and tidy-up times (the answer is that I have a terrible voice, and cringe and want to die each time I sing). The funniest moment was during snacktime (peanut butter sandwiches and apple slices), while all the kids sat to eat, you grabbed your sandwich and ran off to the swing, with a giggle that probably meant “I can have my sandwich and play too. *evil laugh* ). Our phasing in will become more extended with each day, and eventually I’ll be dropping you off in the mornings with Mavis fetching you at 12pm. For now, it’s baby steps and I wonder if it’s not more for the moms than for the kids to have it done in increments? I know it was *just* an hour, but you make me proud, and I’m happy to have turned this next page in our story. Another tearjerking moment. Thank G-d for my waterproof mascara.